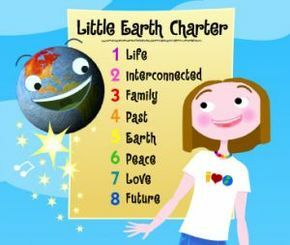 Thus, The Little Earth Charter's focus is to bring that foundation to children aged 4-8. This series of 8 animated clips offers educators a springboard tool to introduce students to a wide variety of subjects within the curriculum. Its content relates directly to learning standards for Grades Pre K-3: earth science, physical science, life science, ecology, environmental studies, geography, history, social studies, citizenship education, and moral education. 1. Life: The Principle of Life means respecting and caring for all living things, no matter how big or how small. All life is important, not just human life, so treat all living things with respect and consideration. 2. Interconnected: The Interconnected Principle means that everything is connected to everything else. Each and every person and living creature has its own special qualities. We all have a place on this earth and we all need each other. 3. Family: The Principle of Family means doing everything that you can to make sure everyone in the human family is well treated; it means that you will work with others to make sure that all boys and girls have a home, clean water to drink, food to eat, a school to go to and a doctor to look after them if they are sick. 4. Past: The Principle of the Past means that you will learn from all the different people who have lived before you, discovering what made their lives good and what made their lives difficult and you will be inspired by their gifts of wisdom. 6. Peace: The Principle of Peace means that you promise to live in peace and to cooperate with others to resolve conflicts in a non violent way. If you do have a conflict, you must seek solutions that are fair to everyone. 7. Love: The Principle of Love means that you promise to be truthful and kind to others, to build trust amongst those that know you and to understand the ways of each person that you meet. It means that you will take responsibility for your actions in all things. 8. Future: The Principle of the Future means that you will do everything possible in your lifetime to make sure that everyone now and in the future can live together in health, peace and harmony on this beautiful Earth.